As we look forward to the release of CS5 before long, I had an unusual 5 days producing a new SWF based on a publish-to Flash Player 5 predecessor. 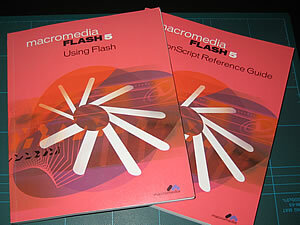 So time to put on my Macromedia cap and dig out the old Flash 5 manuals. This version pre-dates my working with Flash and dates back to when I quite frankly hated Flash. Ironically a number of designer types look on these as the good old days when Flash was very much a designer tool. I have to admit when I first saw Flash V1 further back in 1996 I didn’t rate it. I’d been using programming Director since 1993 and Flash didn’t have Lingo so it had seemed a step backwards to me. The original designer seemed to have no discernible logic to the placement of graphics and their anchor points. Static text didn’t render particularly well — over-anti-aliased. This movie uses features that are not supported in Flash Player 5. View the Output Panel for details. Simply solved by opening the .ai document in Illustrator then exporting a SWF. At which point it is possible to specify the Flash Player version. So saving off a Flash Player 5 SWF and importing that the Flash library rather than the .ai document avoids the problem. As regards the text problem, this proved to be the motivation enough for the client to agree to updating the target player version from version 5 to version 8 in order to take advantage of ‘anti-alias for readability’. Sometimes I wish Adobe would obsolete old versions — much like the current pressure to remove support for explorer 6 from the web. On the other hand I have to admire the facilities across Adobe tools that continue support output to legacy flash player versions for when it is impossible to persuade clients to be more current.